Wayne Warner. (Editor and Compiler). 184pp. Bridge-Logos, Gainesville, Florida, USA. 2005. 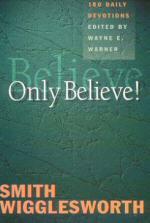 A new edition of ‘Only Believe’ (see below) with a new cover design, the addition of a biography on Wigglesworth and a collection of photographs from the Flower Pentecostal Heritage Center. Wayne Warner is Director of the Assemblies of God Archive in Springfield, Missouri. Wayne Warner. (Editor and Compiler). 209pp.Vine Books an imprint of Servant Publications, Ann Arbor, Michigan, USA. 1996. 180 daily devotions selected and adapted from the sermons of Smith Wigglesworth. Each sermon excerpt is referenced to the original published sermon title. Reissued in 2005 (see above). Larry Keefauver. 191pp. Summit Publishing Ltd., Milton Keynes, UK. 1997. First published in the USA by Creation House, Orlando, Florida, USA. 84 devotionals each combining ‘In the Words of Wigglesworth’ - a brief excerpt from a Wigglesworth sermon referenced to the original published title - a Bible text and a prayer. Also included is a brief introduction on the prayer life of Smith Wigglesworth, a topical index and a bibliography. Judith Couchman. (Compiler). 196pp. Servant/Vine Books, Ann Arbor, Michigan, USA. 1999. 100 promises from the Bible combined with encouragement from Smith Wigglesworth in the form of a brief excerpt from one of his sermons (referenced back to the original published title). There are 24 headings including Blessing, Deliverance, Faith, Healing, Miracles, Power, Prayer, Salvation and Spiritual Gifts. Judith Couchman. (Compiler). 203pp. ‘Life Messages of Great Christians’ Series. Vine Books - an imprint of Servant Publications, Ann Arbor, Michigan, USA. 1997. Compiled by the Publisher with the assistance of Glenn Gohr and the staff of the Flower Pentecostal Heritage Centre, Springfield, Missouri, USA and Rev Desmond Cartwright, Donald Gee Centre for Pentecostal and Charismatic Research, Mattersey, UK. 556pp. Whitaker House, New Kensington, PA, USA. 1999. For each day of the year a Bible verse, a suggested Bible reading, an excerpt from a Smith Wigglesworth sermon and a thought for the day. Larry Keefauver. (Editor and Compiler). 64pp. Creation House, Orlando, Florida, USA. 1996. Larry Keefauver. (Editor and Compiler). 86pp. Creation House, Orlando, Florida, USA. 1996. 30 daily studies based upon the teaching of Smith Wigglesworth. All sermon excerpts are referenced to the original published titles. The Study Guide may be used by individuals or groups. A leader’s guide for group sessions is also included. The purpose of the guide is to help the reader understand faith through the scriptures with insights from Smith Wigglesworth. The Guide is a companion volume to the ‘The Original Smith Wigglesworth devotional’ (see below). Thomas Nelson Bibles. A Division of Thomas Nelson Inc. USA. 2003. 28 Smith Wigglesworth sermon excerpts are included in this bible linked to a specific text and a topic such as Faith, Healing, Holy Spirit and Presence. The excerpts are referenced to the original published sermons (Whitaker House publishers text). Larry Keefauver. (General Editor). 164pp. Creation House, Orlando, Florida, USA. 1996. 90 daily devotionals based upon the sermons of Smith Wigglesworth. Each devotional comprises of a Bible verse, an excerpt from a Wigglesworth sermon and a brief closing prayer.